We looked at the top 1 Ping Pong Tables and dug through the reviews from 7 of the most popular review sites including BestReviews, Ah Joo, Equipment Junkie, Table Tennis Spot, Pong Hero, All Favorite Sports, Fidgets Guide and more. Through this analysis, we've determined the best Ping Pong Table you should buy. The STIGA XTR Ping Pong Table is one of the few ping pong tables designed for outdoor use. It has a design that resists warping and rusting. It arrives mostly assembled, making setup a breeze. An affordable price adds to its benefits. In our analysis of 42 expert reviews, the STIGA STIGA XTR Ping Pong Table placed 3rd when we looked at the top 9 products in the category. For the full ranking, see below. 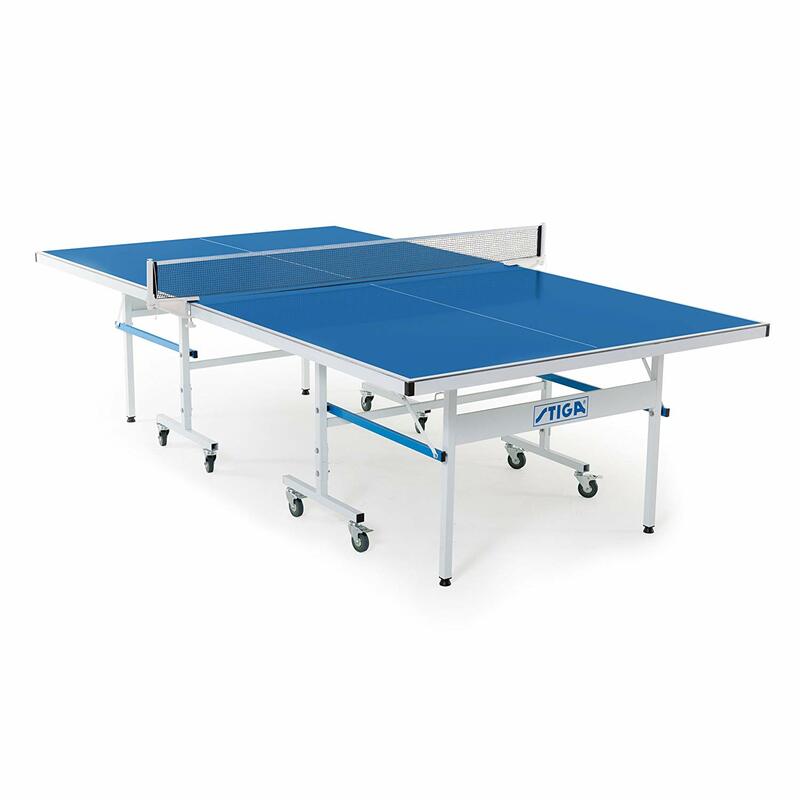 Checkout STIGA XTR Ping Pong Table for a detailed review of all the top ping pong tables. Manufactured with aluminum and steel that withstand different weather conditions. It comes nearly assembled, sets up fast, and folds easily for storage. With a smooth and thick surface, this table gives you excellent ball bounce, improving your performance. The Stiga XTR Outdoor Table Tennis Table was built to last. The frame is held together with 1 and 1/4 inch steel legs that hold the table top level at all times. One of its essential features is the aluminum top which is 6mm thick. It is durable and rust free. The high point of the STIGA XTR Outdoor is the aluminum/composite table top. It's a beautiful playing surface that is just good-looking as it is durable. Not like some other tables where you need to buy the net and post separately, The Stiga XTR Outdoor Table Tennis Table is having the net and post send to you together when you buy the table. Features an excellent outdoor net. Several consumers say that it feels a bit light. Just remember it is an outdoor table and you won’t get the same experience as playing on an indoor one. Its playing surface is thin (6mm). To many people, the top does not offer efficient ball bounce. One major downside of the STIGA XTR Outdoor is that the bounce definitely feels like an outdoor table. Skip the stress of rearranging furniture to fit a table tennis table inside your home and enjoy table tennis outdoors. The STIGA XTR Outdoor table is designed and manufactured with durable, all-weather materials such as aluminum, exterior grade powder coating, and galvanized steel for a table that is waterproof, rust-free, and resistant to sun damage, making it perfect for year round outdoor storage in any climate. This table comes 95% preassembled with only one simple step to complete so you can begin playing in less than 10 minutes. The 6mm aluminum/composite top is supported by a stout 1.5" tubular steel apron to deliver lively and even bounce across the entire surface and resists warping under any condition. The table includes a 72" exterior grade net and post set with string tension adjustment for excellent playability. Below the table, sturdy 1.25" welded steel legs include a self-opening feature so they automatically deploy when opening or folding the table halves for added convenience and safety. The legs also include adjustable height leg levelers to ensure your table has a solid, level playing surface on any terrain. For added flexibility and mobility, the table features 3" ball-bearing wheels that smoothly roll and lock into place for safety. This table includes playback mode for individual practice and each table half can be separated and used as a free-standing multi-purpose table for dining, playing cards, and more. After playing, conveniently fold each table half into the upright position, lock into place with the red safety latch, and roll to the desired location for convenient storage. The separate table halves of the XTR nest together for an ultra-compact folded profile so it can fit into any space.